Microsorum pustulatum (kangaroo fern) is the only member of this genus and family in Tasmania. 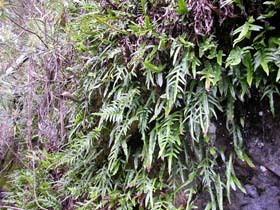 It is a very common and widespread native fern that grows on the ground, rocks, logs and as an epiphyte in rainforest, wet sclerophyll forest and in more open places in the subalpine zone. 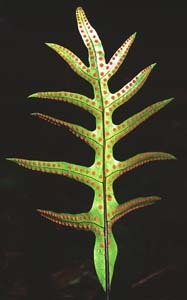 The thick, broad, glossy leaves that are unlobed or with a few coarse lobes, and large (~3-4mm wide) circular sori make this fern very distinctive.